How to get satellite TV in the UK, and a look at what Sky and Freesat have to offer. We provide help and advice on using the Sky and Freesat digital satellite services, to help you make the right choice. Free Sky Q HD box, free standard set-up and an M&S Voucher with the above offer! Sky offers the highest number of digital TV channels. Sky’s service can be received by 98% of homes in the UK, so it offers far better coverage than rival services Freeview or Virgin Media. To get Sky, you’ll need to have a satellite dish installed on the outside of your house and Sky will provide you with a special digital set-top box. Sky’s famous for their Sky+ hard disk recorder boxes, which makes watching and recording TV amazingly easy. In most cases, Sky will let you have one of these high-spec recorders for free. Once Sky has been installed, you’ll get access to hundreds of digital TV and radio channels. You’ll get some top channels, such as Sky 1, Sky Living, Sky Atlantic, Comedy Central, the SyFy Channel, G.O.L.D, ITV2, BBC Three, E4, Fox, Dave, Watch and Alibi. There’s also lots of junk too, including loads of shopping and gaming channels. For a little extra, you can also add premium channels such as the ten Sky Movies channels. Sports fans are well-served with the 4 Sky Sports channels, Eurosport and ESPN. The Disney channels, Music Choice and Sky Arts are available, as well as adult content, and you can get new films on-demand with Sky Box Office. To get Sky TV, you’ll need to have a satellite dish and a special Sky digibox installed at your home, and you’ll need to pick one or more channel packages to subscribe to. In many cases, Sky will supply and install for free. You can order Sky TV online at www.sky.com. When you book, you arrange an installation appointment (including Saturday and Sunday). One of Sky’s installers will turn up and install the Sky dish and digibox, connect it all to your telly, and set everything up for you. Want to know more about Sky Digital? Hundreds of digital TV and radio channels – Far more channels than you’ll find on cable TV or Freeview – including Sky 1, Sky 2, Sky Living, Sky Atlantic, GOLD, Comedy Central, Dave, E4, BBC3, Film 4, SyFy (the sci-fi channel) and loads more. HD: Over 50 channels of stunning High Definition TV. Even if you don’t yet own an HD TV, getting a Sky+HD box will mean you’re ready to hi-def. Recording – The hype is true – the award-winning Sky+ box will change the way you watch telly. Watch TV on your terms, when you want, and don’t miss an episode of your favourite series. Sport – Unrivalled sports coverage with 4 Sky Sports channels, ESPN, Sky Sports News, plus Eurosport , Racing UK and attheraces. Sky’s a must for football, rugby, golf and cricket fans. The hype is actually true… Sky+ will change the way you watch TV. The Sky+ box combines a satellite receiver with a hard-disk recorder that lets you record 180 hours of programmes and movies without tape or DVD. Sky+ lets you watch one satellite channel while recording another TV channel, record two different channels at the same time, and pause/rewind live TV. Sky+ supports Series Link, so you don’t miss an episode of a series you’re following. You can even use your mobile phone to set programmes to record. Sky+ is available direct from www.sky.com. For more on this recorder, see our dedicated Sky+ section. To watch many of the channels on offer with Sky Digital, you have to subscribe to a Sky package. If you don’t fancy paying to watch satellite television, there are ways to watch without a subscription – although the channel choice is limited. 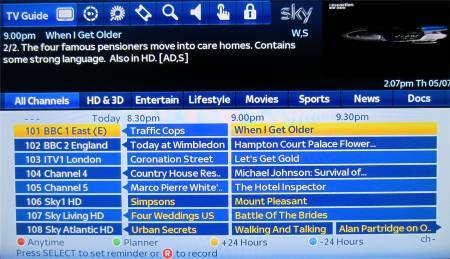 Subscription-free Sky – Sky offers something called Freesat from Sky. 240 digital TV channels for a one-off cost of £175. Sky will install the satellite dish and digibox – and there’s no ongoing subscription. Freeview – This is nothing to do with the Sky satellite system. Freeview is received on suitable set-top boxes or TV sets using a TV aerial, and not via a Sky box or satellite dish.Freeview offers around 60 channels of TV and radio, with no subscription. The channel lineup is quite small compared to Sky Digital. See our Freeview information section for more on Freeview via a TV aerial. Free to air – A number of digital TV and radio channels can be viewed on a satellite receiver without a subscription or a card, as the signal is not encrypted. For a list of the free TV and radio channels that can be viewed with a Sky dish and decoder without subscription, see the Sky Free-to-air channel list.To get these channels, you can use a Sky decoder and dish, or go for a DIY Free to Air Digital Satellite Kit, which is available from Maplin. Details of free-to-air TV in the UK can be found on our Free to view satellite TV page. Paying too much for your TV channels? Here’s an alternative: YouView offers 70 channels of live TV and radio, 4 HD channels, plus over 7,200 on-demand TV shows, movies and catch-up TV, music and kids content. A free high-spec digital recorder with Series Link is also available, and it’ll cost you less than Sky. Details on our YouView Explored section. Satellite TV coverage The satellites used for Sky and Freesat covers approximately 98% of the UK, meaning that Sky and Freesat are available to more homes than Freeview, BT Vision and Virgin Media. Getting satellite TV is only a problem if you aren’t able to get a clear line-of-sight to the orbiting satellite (concrete, trees or hills in the way), or if for some reason you’re not allowed a satellite dish where you live. Entertainment Extra: All of the Entertainment channels, plus Discovery, National Geographic, History Channel, Yesterday, Crime Investigation, Fox News, CNBC, British Eurosport, ESPN Classic, Viva, Bliss, Kerrang!, Q, VH1, Cartoon Network, Boomerang, Disney, Nick Jr and Trouble. With Sky, you also get a number of free-to-view channels as well. There are also optional “Premium Packs” (which let you get the various Sky Movies and Sky Sports channels). Sky doesn’t allow you to pick individual channels to subscribe to – you select from their preset “packages”. To view these options and to see how much your monthly subscription is likely to be, go to sky.com/shop/tv. You can connect the output of your Sky digibox to another TV set in the house by running an aerial cable from the Sky box RF output aerial socket to another TV telly. You can also use a Sky Link so you can change channels from the other room. More on this in our Sky FAQ. You may be able to use a wireless video sender, which saves you having to run cables. Get a second Sky digibox – Sky Multiroom. For more on these options, see our Sky in other rooms section. Note the following limitation: One Sky dish can’t have more than eight ‘feeds’ running from it (and for that, you’ll need to have an Octo LNB fitted), and that assumes that so each dish can only provide a feed for up to four Sky+ boxes, or eight standard Sky boxes. Sky HD Hi-definition (HDTV) offers a higher quality picture with more vibrant colours, greater detail, crisp clarity and amazing sound quality. Sky is the leading HD provider in the UK – For more details on Sky’s HD service, take a look at our dedicated Sky+HD Information page. Where is the satellite? Sky Digital broadcasts from a group of satellites positioned at 28.2ºE and 28.5ºE above the Equator. These orbit the earth at an altitude of around 22,000 miles. Outside the UK The Sky Digital TV service is only officially on offer to those living in the UK (including the Isle of Man and Channel Islands). There’s also the Sky for Republic of Ireland service. That having been said, the “footprint” of the Astra satellites used by Sky allows signals to be received in other parts of Europe. The picture on the right shows an approximate “footprint” of the Astra 2D satellite, which transmits the BBC channels. Can’t get satellite TV? 98% of the UK can get satellite TV, but if you can’t get a satellite dish where you live, or don’t want to pay for Sky, see our page of digital TV alternatives. Sky Broadband Sky offers free Broadband to its digital TV customers who get their Talk package. The basic Sky Broadband free service offers limited bandwidth, but you can pay extra to get service up to 16 Meg, if supported in your area. Received sky hd box to change from sky+ ,what do I connect my 3 arial connections to? In my living room I have a socket which has sat,return,tv, radio. I have no socket in the bedroom. I have an old sky + HD box that I want to put in the bedroom for freesat from sky. I also have a freesat recorder that I want to put in the living room. Is this possible with the sockets I have and if so how do I do this. Do I need splitters etc. does anyone know of a company or person who can set up all my phone, tv and broadband services on my new house which is a new build property in Bedfordshire? please how can i set up my tv on sky tv channel or uk freeview channels ? SOURCESTV in Tottenham.